Following on from his recently successful Kickstarter campaign for the ProtoCam designed as a Raspberry Pi camera module add-on board to aid with the development of Pi projects. 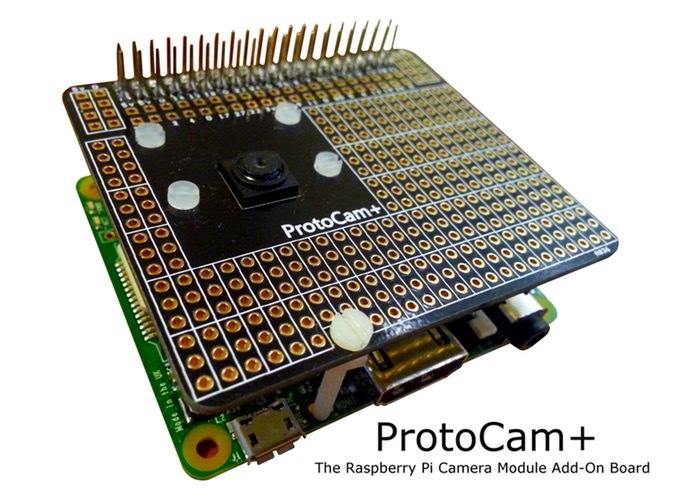 Developer and Raspberry Pi enthusiast Richard Saville has now created ProtoCam+ a new Raspberry Pi A+ B+ camera module add-on board, watch the video after the jump to learn more. The ProtoCam+ has been specifically designed to offer makers, developers and hobbyists who enjoy building projects using the Raspberry Pi mini PC. An easy way to build projects and prototypes around your Raspberry Pi Camera Module, using the latest Raspberry Pi A+ and B+ computers. The ProtoCam+ is equipped with a ‘breadboard style’ prototyping board that holds your Raspberry Pi Camera Module inside the PCB itself, allowing users to solder components directly around the camera lens with ease. The ProtoCam+ project is currently over on the Kickstarter crowd funding website looking to raise £800 in pledges to make the jump from concept to production. So if you think ProtoCam+ is something your Raspberry Pi camera project could benefit from, visit the Kickstarter website now to make a pledge from as little as £6 and help the ProtoCam+ become a reality.